Supply chain management (SCM) is essentially a set of approaches utilized to efficiently integrate suppliers, manufacturers, warehouses, and stores, so that merchandise is produced and distributed at the right quantities, to the right locations, and at the right time in order to minimize system-wide costs or maximize profits while satisfying service level requirements. To solve complex problems in SCM and to obtain optimization, various meta-heuristics algorithms can be used. Thus, this chapter discusses the background of meta-heuristics algorithms. 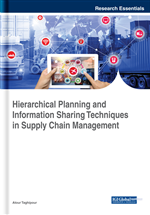 The related work and future research direction for using meta-heuristics approaches for supply chain management are addressed in this chapter. Furthermost of real-world, SC problems are complex due to high number of indices which increase the dimension of the problem and it may lead to inefficiency of routine solution approaches (Fahimnia et al. 2013). Increase in the size of problem and the exponential growth in complexity makes the model to be NP-hard (Park et al. 2007; Jolai et al. 2011). Meta heuristic solution methodologies can be applied for the above problem. Two classifications of meta heuristic algorithms are as follows: (1) population approaches, such as ant colony optimization, the genetic algorithm, particle swarm optimization, and bee colony algorithm; and (2) trajectory approaches, such as the tabu search, and simulated annealing. The Artificial Bee Colony (ABC) algorithm is a swarm intelligence algorithm stimulated by the foraging behavior of bees and it was introduced by Karaboga. In ABC algorithm, the colony comprises of three types of bees such as employed bees, onlooker bees and scout bees (George & Binu 2018). In this algorithm, each food source represents solutions of the problem and nectar amount represents fitness of the solution (yadhav et al 2017). Onlooker bees who are associated with a food source make decisions based on the dancing of employed bees. Scout bees are responsible for searching food source. Onlookers and scouts are also called unemployed bees. In the initialization phase scout bees will search and find the food sources. Thereafter, the food sources are exploited by employed bees and onlooker bees. This manipulation will cause the food source to become exhausted. Whenever the food is exhausted, the employed bees that are associated with that particular food source will become scout bees and search for food source. Number of food sources and number of employed bees will be same since each bee can produce one and only one solution.